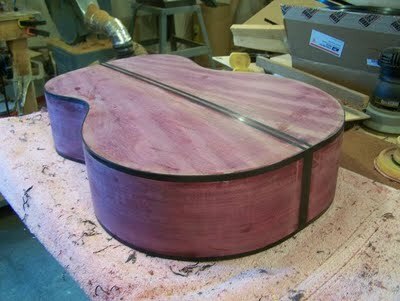 A good pictorial detailing this purpleheart guitar’s construction here. 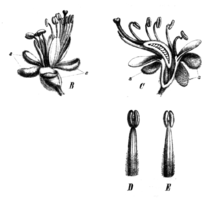 Species: porphyrocardia, venosa, paniculata, and others. For all you botanists out there, Peltogyne paniculata, according to Wikipedia. Purpleheart refers to many of the species from the Genus Peltogyne. When cut, the heartwood appears dull gray/purple-brown. Once exposed, it turns into its vibrant trademark purple. Over time, this color can fade, but the striking violets can be somewhat retained using a high-quality UV inhibitor. 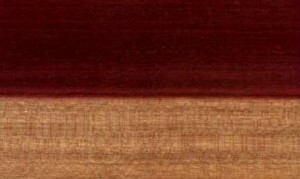 Purpleheart has generally straight grain, but irregularities are common. Texture is medium, while the pores are tight. Further information is found here, as seen in the Wood Explorer database. Amarante, Amaranth, Barabu, Bois violet, Ellongrypho, Kooroobovelli, Koroborelli, Lastan, Morado, Palo morado, Pao violeta, Pau roxo, Pelo morado, Saka, Sakavalli, Violetwood. $$$ Purpleheart is a relatively affordable and widely available specialty wood in the United States. Audio equipment, billiard cues, bridges, millwork, skis, sporting goods, wharf construction, specialty guitars, veneers, furnishings, cabinetry, small wooden craft items.